Carl Belz while director of the Rose Art Museum. Giuliano photo. 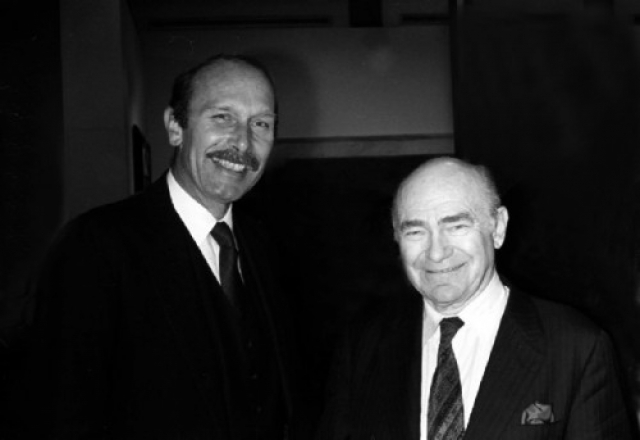 Belz with founding Rose director Sam Hunter. Giuliano photo. A graduate of Princeton, where he was a star basketball player, Carl Belz earned a Ph.D. there in art history. 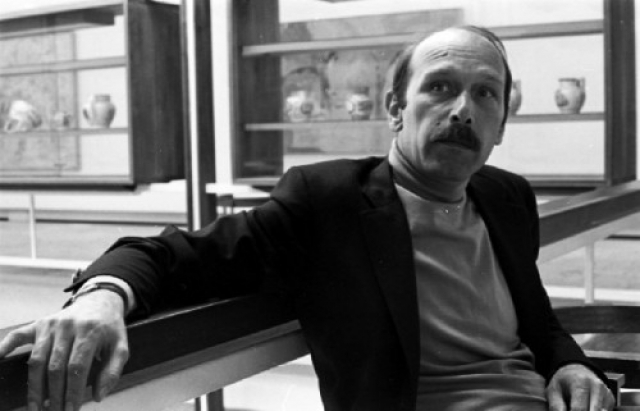 In the 1960s he joined the faculty of Brandeis University and in 1974 took over as director of the then moribund Rose Art Museum. He remained director of the Rose for the next 24 years but was forced out when Lois and Henry Foster, the primary donors of the contemporary art museum, planned an expansion designed by Graham Gund. Belz died recently of a heart attack at 78. He took over at the Rose during a bad period for Brandeis. Many of its graduates had taken to heart its liberal and radical education. Several made the FBI most wanted list. Conservative Jewish philanthropists shifted their attention to supporting Israel. Brandeis which was founded and flourished after WWII under president Abe Sachar had expanded rapidly with a dense campus that was heavily leveraged. When Belz took over at the Rose it was a shadow of its former self. It was founded by the flamboyant curator, historian and entrepreneur Sam Hunter. He created a core collection of works by Pop art masters which set the museum along the path of housing one of the finest contemporary collections in the Boston area if not New England. Following Hunter, who passed away while a professor at Princeton, he was followed by another distinguished Princeton professor and former MoMA curator, William Seitz. Belz took over as the fourth Rose director with a skeletal budget for programming. With severely limited funding he focused on showing and promoting local and regional artists with particular support of women. This emphasis was augmented with the later hire of Susan Stoops as curator. She is now a curator with the Worcester Art Museum. As Brandeis gradually recovered so did support for the Rose. There was an annual Lois Foster exhibition mounted during commencement. This entailed shows and catalogues with major artists. After being forced into retirement from the Rose, for a period of time, he was editor of Art New England. The co-publisher of the magazine was his daughter Portia. She later sold her interest in the publication. Over the years of his tenure I often met with Belz to review exhibitions and discuss contemporary art. What follows is the first of three installments of an interview from 2011. There are links to the second and third parts of the dialogue. "Great series of interviews with Belz forming informative narrative of that time: thanks Charles fir this public service to arts community . Posted all 3." "so tough to lose them. not only were ken moffett and carl belz very close friends of mine, but they died so close to each other. i will always miss them. carl's death was particularly shocking because a few days before he died ,we had a pleasant ,calm email exchange. the morning after carl died i happened to go on facebook to wish a friend a happy birthday, first thing i saw was news of carl's death. carl did so many wonderful things for the rose art museum. he had a curious inquisitive mind. he had a sense of both the internal and external affect that art has on the world. when he showed work, it was out of a sincere need to make something worthwhile for people to consider. so sorry to lose him. so glad that you did that interview with carl." "He was a major figure in the evolution of the Boston art scene. Tx Charles"
"Good article Charles! I don’t know if you know that my husband james Montford also went to Brandeis. It seems he was the first Black graduate of the Fine Arts program there. FYI: Susan Stoops is no longer with the WAM. Not sure what she’s doing now, though." "He was a sweet man, too." "Thx for this Charles! Carl was such a seminal figure in the Boston art scene back in my day." "A beautiful tribute to Carl - thank you." "Really interesting Charles, the history of the Rose. Glad you saved the interview. Carl was a kind man. Sorry to hear of his passing." "Susan Stoops is no long curator at Worcester. A memorial for Carl Belz is at 2pm on Oct. 2 at Cambridge Art Association."